I love books about books! Any story that even so much as has a hint of books, bookstores, writing books, and I’m all about it. So I bought Midnight at the Bright Ideas Bookstore by Matthew Sullivan based solely on the cover. Yes, I literally judged this book by its cover. And yes, I liked it. 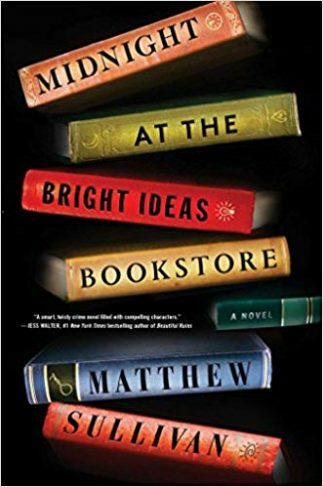 The premise is a fun one: Lydia Smith is living a very quiet, low-key life, working part time at a the Bright Ideas bookstore – a planned life meant to conceal a very public and traumatic past. All of her efforts begin to crumble when a favorite customer commits suicide in the bookstore, while in possession of a photograph of her from her childhood. I’ll leave the rest for you to read, but what follows is a wonderfully weaved mystery of family, forgiveness, honesty, trust and vulnerability. Matthew Sullivan is fantastic writer. His setting is inspired, or so I surmise, from his time working in a bookstore, and for me it shines through brilliantly. They say write what you know, and he’s done a fantastic job of creating a place I definitely wish I could visit (trauma aside). Mr. Sullivan also does a great job creating his characters. The main characters are flawed and frightened and beautifully developed and relatable. The supporting characters serve to add color and quirk, humor and mystery. And I can’t imagine a better name for a group of book store patrons than “Book Frogs”. If I had a to be given a nickname based on my frequency at a book store, I hope it would be something as charming as this. I will say, stretch your reading muscles on this one. Mr. Sullivan loves a long sentence, and if you’re not prepared for it his writing style could become a bit exhausting. It took me several chapters to adjust, fighting against the creeping desire to label this book a style not compatible with my tastes. Boy, am I glad I didn’t give up. An excellent book for the patient mystery lover!